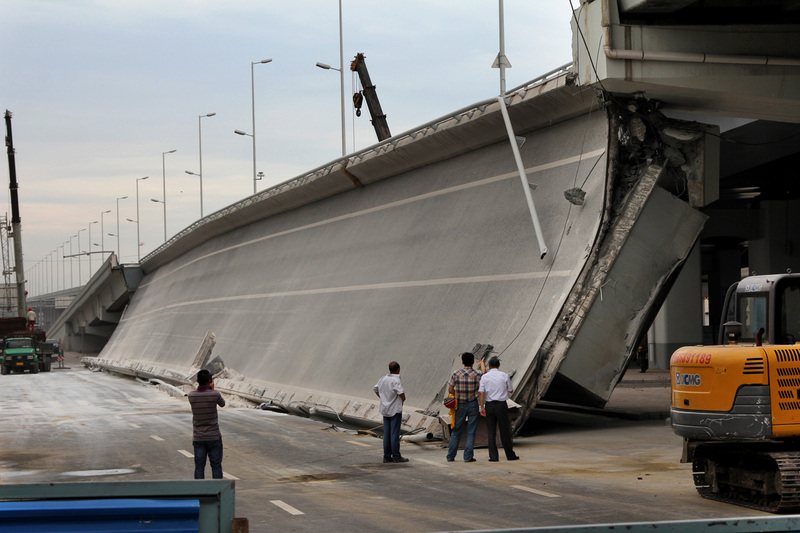 Eight bridges have collapsed around China since 2011. Here, government investigators examine a recently built entrance ramp that collapsed last week in the northeastern city of Harbin, killing three people. Local residents believe government corruption and substandard materials are to blame. When the Yangmingtan bridge opened in the northeastern Chinese city of Harbin in November, local officials hailed it as a grand achievement. The bridge stretched more than nine miles and cost nearly $300 million. Construction was supposed to take three years, but workers finished in half that time. "A lot of comrades didn't go home for more than a year, never took a holiday, never took off a weekend," Yang Qingwei, the party secretary of a bridge construction company, proudly told Heilongjiang provincial TV. But early one morning last week, an entrance ramp to the bridge collapsed. Four trucks on the ramp tumbled to the roadway below. Three people died and five were injured. The government initially blamed the trucks, saying they were overloaded. But infrastructure fails so often in China, most people assume the real culprit is government corruption. Since 2011, eight bridges have collapsed around the country, according to China's state-run media. The cases include one in April 2011, when a cable snapped on a suspension bridge in Western China's Xinjiang region, sending a chunk of roadway plunging onto a riverbank. Two months later, a bridge in southern China's Fujian province collapsed, leaving one dead and 22 injured. And in March this year, a bridge under construction in Central China's Hubei province snapped in half. The collapse in Harbin sparked more than 2 million posts on Sina Weibo, China's most popular Twitter-like site. The reaction of Zeo Niu, a college junior studying in Harbin, was typical. Niu's uncle runs a construction company in central China. She says using substandard material while charging for high-quality goods is routine. "This analogy is made by my uncle," she said. "If the central government wants a steel bar, it should be 10 centimeters. When it comes to the province, it will be 8 centimeters, and when it comes to the city, it will be 5. This is very, very common. This is not news." In fact, corruption and failing infrastructure have been a problem in China since the 1990s, when market reforms set the country's economy on a rocketlike trajectory. The government went on a sustained building boom that provided unprecedented opportunities for graft. Zhu Lijia, a professor at the Chinese Academy of Governance in Beijing, said bid rigging is the norm and there are no checks or balances on the procurement process. "The situation is going in a bad direction," said Zhu in a phone interview from Beijing. "We do have relevant laws regarding the bidding process, but there is a lack of enforcement. The bidding process is only a show." Chinese have a phrase for these failing infrastructure projects: doufazha, which means "bean curd dregs." The most infamous case occurred in 2008, when a massive earthquake struck Sichuan province. In one poorly built school alone, 700 children were crushed to death. "These were charity projects, and officials dared to skimp on the job and use low-quality materials," said Zhu. "This was much worse than Harbin. Up until now, we haven't seen any officials punished." The Yangmingtan bridge collapse has generated a variety of reactions in Harbin. Many people refused to discuss it this week with a foreign reporter for fear that they would get in trouble with the local government or bring discredit to their country. Others saw the collapse as a symptom of deeper problems with China's one-party system. A man surnamed Zhang, who designs furniture, said infrastructure continues to collapse because there is no way to police the government. "China's civil society is not strong enough," Zhang said over Pepsis at a local KFC. "It's too fragmented and too weak and can't force the party to make changes." Others in Harbin see collapsing projects as a fact of life in a rapidly developing country with no rule of law. "Probably as the system improves, these problems may be solved," said a chemistry doctoral student who gave just his surname, Sun, not sounding terribly convinced himself. Sun, 30, was hanging out on a bench at the Harbin Institute of Technology in a blue T-shirt, camouflage cargo pants and Crocs. Asked how society solves a problem like this, Sun was at a loss. "We want to participate, but we aren't the government," he said. "We are just common people. We can give the government ideas. We can discuss this hot topic in private and online. That's all we can do." Zeo Niu, the college student, is angry about the infrastructure failures. But she says what really upsets her is that so many projects collapse, people just become overwhelmed. "I will never remember those victims' names in this accident, and people won't remember it," Niu said. "It will be buried by another accident."